eff feels that Americans should always contribute to the greater good of their country. For the past two years he has worked with the General Patton Museum in Fort Knox, Kentucky to recreate an authentic military command vehicle. Featured in G.I. and Veteran events, parades and funerals, the vehicle is equipped with sirens, air horns, a sound system, a fifty caliber machine gun and a thirty caliber machine gun. eff hopes this nine thousand pound "War Wagon," known as "Old Blood-n-Guts," will help promote patriotism, encourage support for our armed forces and honor veterans in a way that would have made the General proud. art of this display includes a replica of the General's uniform. 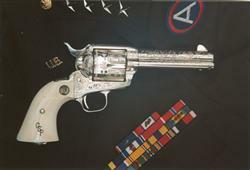 Much research has gone into the authenticity of the helmet, boots, ribbons, holsters and particularly, the fully engraved, ivory gripped Colt single action army revolver. Many of these items were actually manufactured by the same companies that the General used in the 1930's. 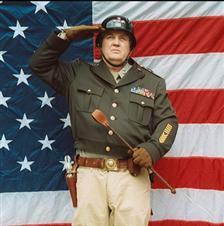 In addition, Jeff's son, Hunter, accurately portrays Patton's driver of four years, Sergeant Mims. o great decisions were ever made in a swivel chair; They were made in the field." 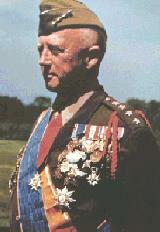 Jeff in full Patton regalia. Left: Jeff holding in his right hand the General's famous Colt. In his left hand is Jeff's engraved reproduction Patton Colt. 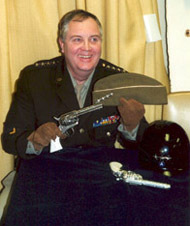 Middle: Jeff with General Patton's famous Colt and the General's hat. 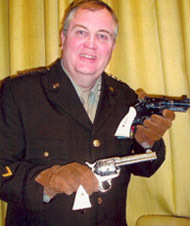 Right: In Jeff's left hand, General Patton's famous Smith & Wesson with ivory grips. Pictures taken at the Patton museum in Fort Knox, Kentucky. 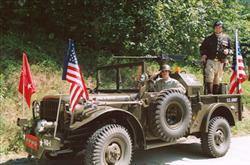 Left: Jeff and his son Hunter in the 'Old Blood n Guts' War Wagon. 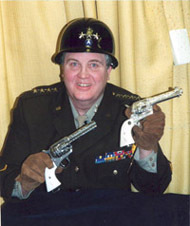 Right: Jeff Flannery reproduction of the famous Patton Colt.